Trabzon airport. It’s raining this morning, after two days of clear and sun. Not a bad day to leave, I suppose. There’s no easy way to travel by air, not through a place like this. I want to go carry-on. But I have my computer backpack, a small bag for my clothes and a plastic bag of stuff I bought. So I’m overloaded. Then there’s my waist pouch. And of course everything must go through security, including jacket and belt. And this tiny airport is filled with some real Black Sea provincials. I maintain equanimity through it all; I’m just observing. Did I mention wifi doesn’t work? I get a network, but nothing opens. None of this is a problem. This relatively little room is rather crowded and I’m lucky to have a seat. There’s a lot of older folks dressed in provincial garb: woolens and headscarves. Ukrainian businessmen on mobile phones. Yesterday I went on a tour of a tea processing plant and hazelnut processing and packing plant. The hazelnut plant was especially intriguing. It was a largely sterile facility, so everyone was dressed in labcoats. There was bright light everywhere and no windows. Overwhelming white noise from various machinery, but no music, no talk. The workers were almost exclusively women, most of them young, in their early twenties or even younger. 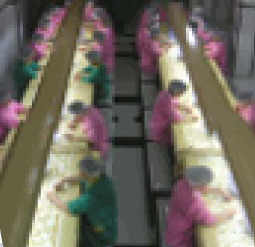 Two long rows of them, at least ten sat on each side of the sorting belt, patiently picking out those nuts that still had bits of the brown skin of the nuts’ inner shells. No talking, no music, no natural light. Eight hours (I’m assuming) each day. But placid faces. Beautiful even. Not very interesting to talk about pain again. But at least this pain does not appear to be digestion related. It's just knee and hip pain on my right side that woke me up early. It's cold and raining this morning. No surprise about the pain, I suppose. I dreamt about creatures that were part man and part animal and poorly treated by humans, although many of them could talk and at least mimic human phrases. These creatures looked like ugly, unrefined humans, but they seemed good-spirited and not particularly stressed-out. I wonder what they could symbolize. I went swimming with Lucia yesterday and swam hard. It seemed to help the him pain, but not the knee. I wanted to stay a bit longer in the sauna afterward than I did, but hopefully I'll go to the baths Tuesday morning where I'll do the hot-cold circuit several times. I bet that will help some. I thought perhaps my vegetarian diet could be contributing to the pain. But when I googled "arthritis vegetarian" all I saw was how a vegetarian diet can help reduce arthritic pain. It seems that my health insurance is good for Hungarian clinics, etc. So I may give that a try, hassel as it is. Maybe some tests could reveal something. I plan to attend Lucia's beginner Yoga workshop this afternoon and Kevin Gardener's Yoga class tomorrow morning. The last time I went to him while I had such pain, it was gone by the end of class. Kevin recently turned 61. He could easily pass for 45. My teaching this past week was challenging, but not bad. I taught Advanced Newswriting twice, Public Speaking twice and Online Marketing once. They're all basically new courses for me, so preparation demands are high and uncertainty looms before every class. All the classes contain a mix of international students from Nigeria, Portugal, Iran, Moldova, Bulgaria, Croatia, Canada, Puerto Rico (USA), US, China, Germany, Italy and Hungary. One Nigerian fellow helpfully approached me after Public Speaking in Thursday and suggested that we spend at least part of every class speaking, where every student speaks. I'm so happy he did this. I will incorporate such a segment into each class. During that class I read a speech by Harry Truman about public service. I mentioned how he was the president who dropped the A-bombs on Japan. The class had some trouble dealing with this. In the speech, Truman mentioned how one should not worry about the verdict of history when making decisions, but to live in the present and make the appropriate decisions at the time they are made. It seems he was thinking about the bombs (the speech was made probably two decades after they were dropped). The class, particularly the Nigerians, are excited about the prospect of an Obama presidency. On Thursday in Journalism I was in pain and unprepared, so I captivated the class with stories about immortality, faster-than-light travel and an old Jewish tale of the Fox and Leviathan. Online Marketing is held at another school, an Hungarian one, unlike the others that meet at McDaniel College Budapest which is a local branch of the US college of the same name based in Maryland. In Online Marketing we discussed web design and looked at some student blogs. It seemed to go well. students are required to make and develop their blogs with the aim of evolving them into commercial vehicles. For all the classes, preparation is the most time consuming and stressful bit. I tis nice that I have Tuesdays and Fridays essentially free. I skipped meditation this morning, hence my writing this. Watched Palin-Biden debate last night with Lucia. Both were impressive. Biden more so, in my opinion. His ticket has my vote, at least in spirit.